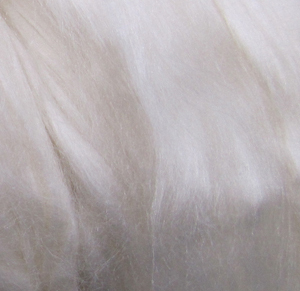 Mulberry silk, from the Bombyx silk moth is pure white and has a magnificent and unmistakable sheen. The caterpillars live out their life cycle, gorging on Mulberry leaves until they are ready to begin to spin their cocoons. You can buy Mulberry silk in several forms for spinning but our combed top is not only easy to spin but it takes dye almost instantly, for a dazzling product. Our Mulberry silk with Merino is a natural white color. It is a blended top of 50% mulberry silk sliver and 50% 19 micron merino wool. Mulberry silk is a very luxurious fiber. It makes a very strong and lustrous yarn with wonderful drape. Silk is very receptive to dyes and will retain its luster after dyeing. Because of its long length, a yarn can be spun very fine if desired. Weaver Creek Fibers imports the finest silk sliver which originates in China. Mulberry silk sliver is named after the fact that the silk is from silk worms who live on a diet of mulberry leaves only, whereas tussah silk is from silk worms who eat a variety of leaves.